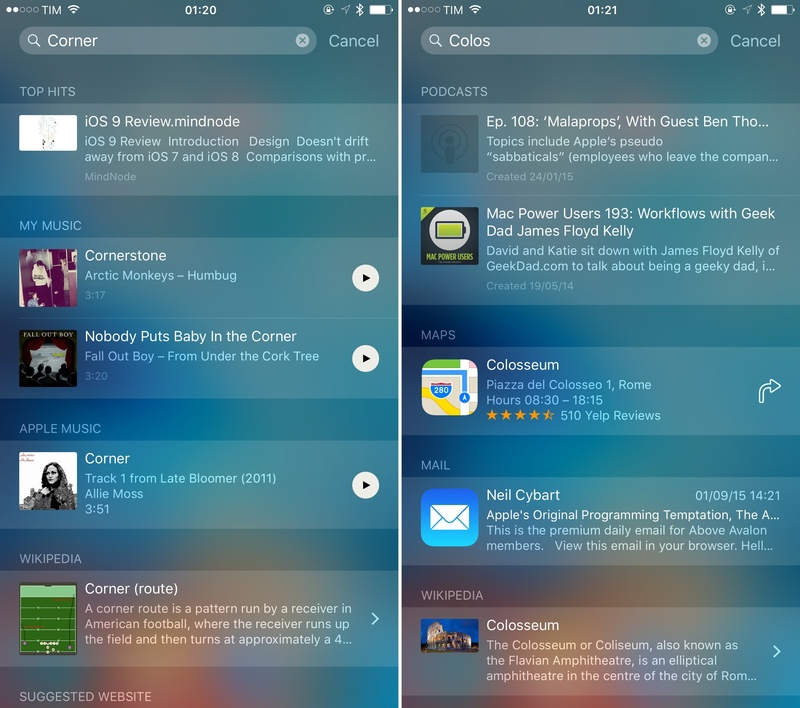 Today, iOS 9 Search is useful to find content from installed apps. The ability to look for specific pieces of content and quickly get to them has been a major addition to my workflow and, if anything, the biggest hurdle in using Search has been remembering that I can now look for everything on my devices. After years of being used to opening apps first and finding content second, it's hard to kick a habit entrenched in muscle memory. For their own apps, Apple has done a good job at ensuring content found in Search is properly displayed and highlighted once opened in the relevant app. When you open a message from Search, the message bubble in the Messages app is darkened to indicate it's the selected result; a reminder opened from Search gets a bold title in the Reminders app; podcast episodes and Mail messages are also shown as selected items in the respective apps after you open them from Search. Part of this was already in place with iOS 8, and it's been extended to more apps with iOS 9. As for third-party developers, it's up to them to figure out ways to restore their app's state when selecting search results, but most of the apps I tried with Search support – Dispatch, Drafts, iThoughts, and others – used similar techniques to update their UIs and restore results. I'm still learning how to remember that I can now find information and documents more quickly thanks to Search. I've become a fan of the ability to look for songs and playlists in My Music and play them right away from Search – and I like how iOS adjusts the ranking of songs based on those I've been listening to recently. Searching for messages in Mail has been considerably faster and more accurate when done from Spotlight than the app's own search feature. I love how the Podcasts app exposes show descriptions and notes to search, and I've grown accustomed to jumping to specific sections of the Health app and iThoughts via Search. I can't wait to see what apps like Slack, Dropbox, Editorial, and Pocket will do with Search and how that will speed up the way I move across apps and tasks. My main concern with new data sources available for Spotlight is that Apple hasn't built more advanced controls to choose how app content ends up in there. In iOS 9, it's possible to turn off apps that populate results in Settings > General > Spotlight Search, but there's no way to reorder apps and make sure that, for instance, Mail results are always at the top. This, combined with the way iOS 9 dynamically ranks results based on engagement and puts some of them in a Top Hits section, has caused me some confusion from a spatial perspective, as results aren't always in the same position or in the same order. Also, because indexing local app content can be a CPU-intensive task, background updates to the database may not be immediate (though this has been sporadic in my tests) and the search functionality of NSUserActivity and CoreSpotlight is not supported on the iPhone 4s, iPad 2, iPad (3rd generation), iPad mini, and iPod touch (5th generation). Developers will have to carefully consider how to index their app content to avoid consuming too many resources, but I'm optimistic the system will scale gracefully on latest hardware. Results on my iPad Air 2 come up almost instantly as I start typing a query, and they continue to update in real time as I add keywords. Apple hasn't built a traditional document-based search feature in iOS 9. For the past two years, the company has been enhancing its Spotlight search tool with external integrations such as Wikipedia results, movie showtimes, and snippets of web results from Bing. iOS 9 expands that to account for the richness of data inside apps. While users will be able to launch apps and look for documents in the traditional way, Search in iOS 9 is aware of the unique nature of apps, which may include activities, points of interest, sections of a document, and other subsets of content. In a post-PC world, it makes sense to have a new kind of search that focuses on what's inside apps rather than filenames alone. Modern apps aren't static containers of files. They're rich experiences, and iOS 9 can index the activity that takes place inside them. App search in iOS 9 has lived up to my expectations. I'm waiting to see what Apple has in store for their server-side index.